The website for Fowey Hall claims it to be the original inspiration for Kenneth Grahame’s Toad Hall. Whether or not the Wind in the Willows author (and former Bank of England secretary) ever visited Fowey is harder to ascertain. Nevertheless it is an appealing, and fitting, thought. 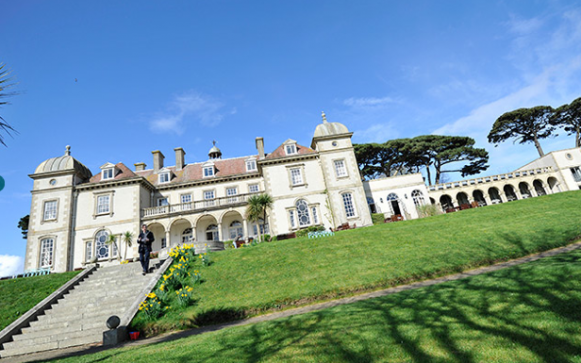 Fowey Hall is now owned by the Luxury Family Hotels Group and, as with all the properties in the group, it sets its stall out clearly. Thankfully this includes being dog friendly. Eat: The main restaurant is the only public area that doesn’t allow dogs. Thankfully head chef James Parkinson’s wonderful menu (including inventive use of the fresh local ingredients) is also available in the Morning Room, where your dog can join you for dinner. Resident dog Bramble (a very friendly Sprocker) will give up some of his own food if (heaven forbid) you forget the food for yours. Sleep: The 36 rooms vary in size from large to the enormous (many are set up to take larger family groups) and all are luxuriously furnished. Plenty are dog friendly, with the exception of the Garden Rooms, which are accessed via the restaurant. There is a £10 extra dog charge that includes blankets, a bed and a bowl. Walk: The combination of substantial grounds and traditional seaside town of Fowey (not to mention the nearby dog-friendly beaches at Lantic Bay, Par Sands) make for a great happy dog holiday or short break. The South West Coast Path runs nearby (the Par to Polperro Trail). Nearby attractions such as the Eden Project and Lost Gardens of Heligan are also open for dogs.